10 years ago today, Grand Theft Auto III was released on the PS2. I actually remember its release at the time. I didn't have a PS2 then, so my friend brought his over, and we played for hours. Most of that initial gameplay wasn't even spent on completing missions, as we were having way too much fun driving around and going on rampages. After that brief chaos, we finally decided to play some of the missions, and became instantly engaged. While I didn't recognize it at the time, I was about 15 after all, GTA III had some top-notch gameplay, awesome voice acting and a nice story to follow along with the many surprising moments that happened throughout the game. The dialogue in the game is still pretty memorable. Who could forget the cast of crazy pedestrians saying things like "My mother's my sister!” and "Yep, I've been drinkin' again." The quote above involving the character 8-Ball was very early in the game, and gives you the first chance to drive as him and you escape from prison transfer. GTA III's intro was great as well, and helped set up why Claude is willing to work with the many colorful characters in Liberty City. The way that Rockstar helps you in their games started in a way with GTA III. The small bits of text in the left corner of the screen as you progress in the game was far better than tutorials in my opinion as they didn't make you stop and read — They we're just there if you needed it. Let's not forget the gameplay—we probably couldn't if we wanted too! It's everywhere nowadays! The basics that began in GTA III are still very prominent in current and upcoming major open-world titles. Driving to a destination, watching a brief cutscene, and then driving out to the mission and probably driving to eliminate someone who has dis-respected the many people you work for. It’s changed a bit now, but at the time, it was revolutionary. You knew exactly whom you were working for, and exactly what they wanted from you. You just had to go out into Liberty City and get things done. Another element that GTA III started was the audio content provide when in vehicles. After “borrowing” a car from an unsuspecting citizen, the HUD for the radio stations would appear, giving you a chance to listen to some tunes. Licensed tracks were all varied and featured both known & unknown artists, who most likely became known after having their music exposed to a brand new audience. The music was top-notch, but it’s hard to mention GTA without talking about Lazlow, the crazy Dj who takes calls from even crazier callers. Each call and commercial on the game was unique and very hilarious. The writing and voice acting really made you feel like you were actually listening to a real station. We’ve had a few releases of Grand Theft Auto since 2001, but I’ll always remember who different GTA III was. The first 3D game and one of the best PS2 games around really put Rockstar on the map. 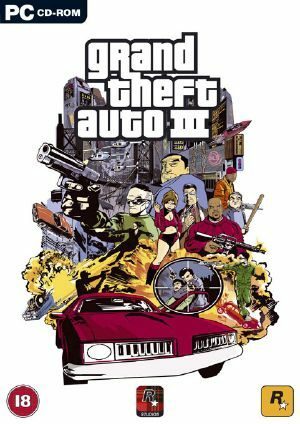 As they begin to re-release GTA III on mobile devices, finish work on Max Payne 3, and prepare the final touches on L.A. Noire for PC, I hope they get to work on the next GTA game and never forget the formula they made with GTA III to improve their titles. Happy 10th, Grand Theft Auto 3!! !